This would be a delicious soup to serve for Valentine’s Day, with a salad, a loaf of fresh, crisp-crusted bread and butter. It has a souper good flavor. (Eye-roll at the “souper”) Yum! Be sure to cut small morsels (love that word) of beef. Nothing worse than a giant chunk of stew beef in your soup. Beef is heating in oil after being seasoned with salt and pepper. 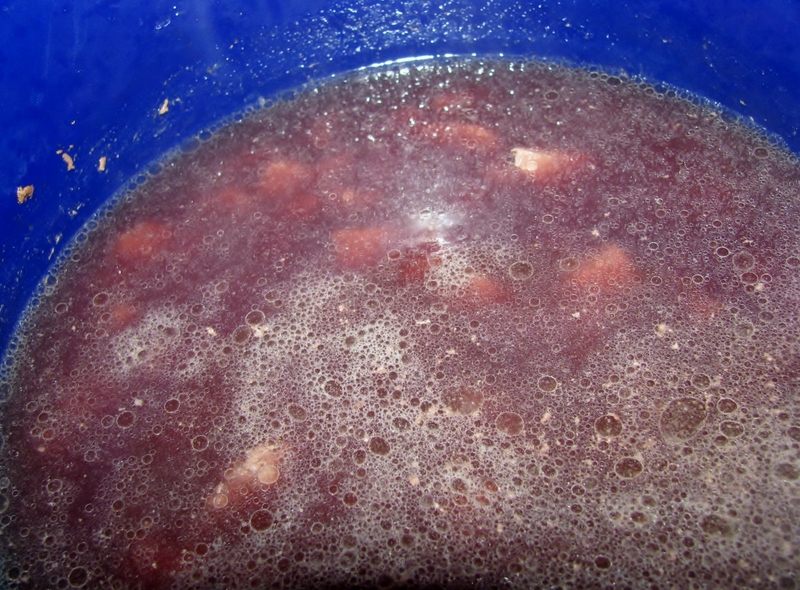 Beef broth and burgundy have been added. 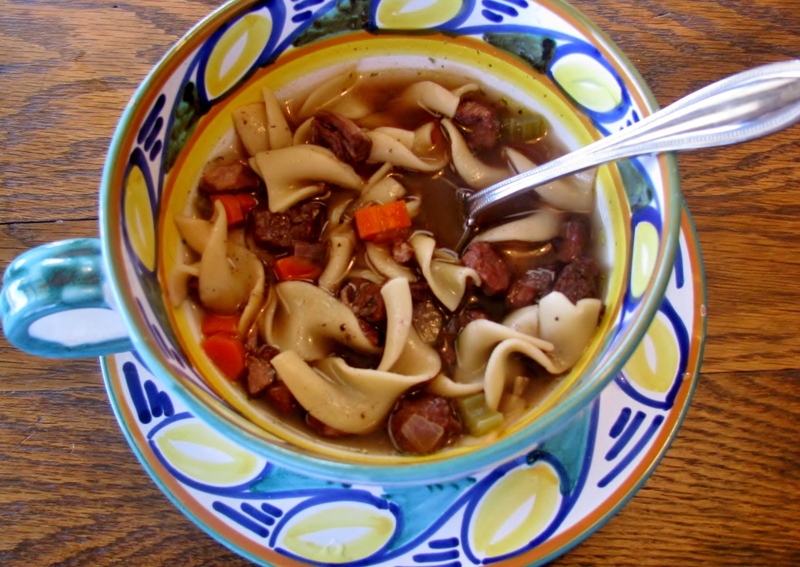 A few notes here – 1) I have used chicken broth when I didn’t have beef and it was fine. You could probably use water as a substitute as well as the beef is very flavorful, but I have not tried that. 2) Use a burgundy or any red wine that you like, but do not use a wine that you would not drink. Some people (they know who they are) will cook with a nasty tasting wine, wrongly believing that the heating process will improve the flavor of the wine. It won’t. Trust me. Life is too short to drink nasty wine, whether it’s in your wine glass or in your Boeuf Bourguignon soup! You may notice that the mushrooms are absent from this picture of the veggies. Well, that’s because they did not make it into this batch of soup. Several members of my family are anti-fungi (against mushrooms) so if we are all eating it, I leave them out of the pot and just slice a few up for my bowl of soup. If you are an anti-fungi as well, it is fine to make this soup without them. You’ll never miss them. And the veggies are in. Heat 2 Tablespoons of oil in a heavy sauce pan or stock pot. 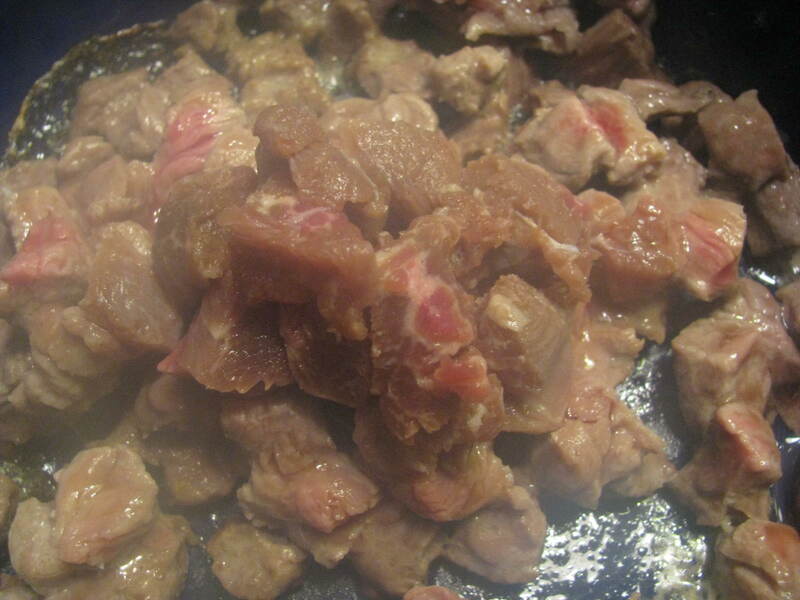 Season meat with salt and pepper place it in the pan to brown for a few minutes. 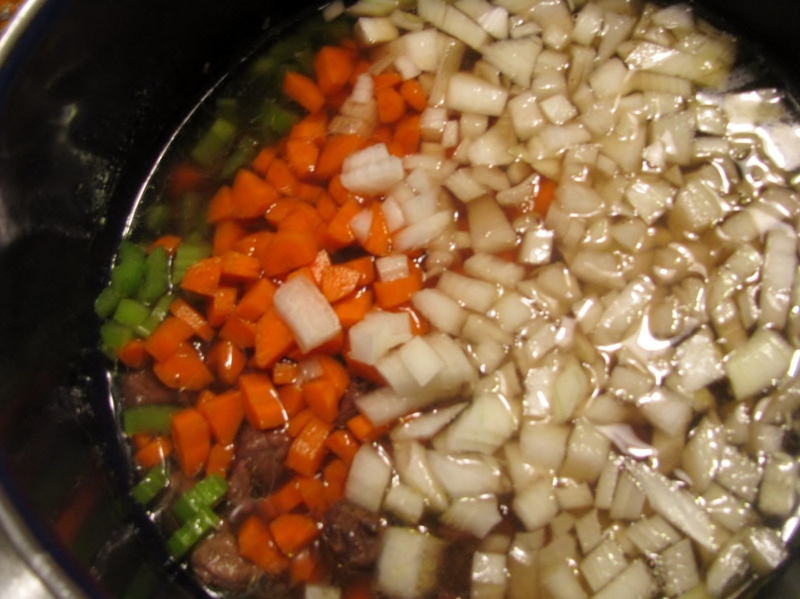 Add 2 Cups of Beef Broth and 1/2 Cup of Burgundy. Simmer gently for at least 30 minutes to one hour until beef is very tender. 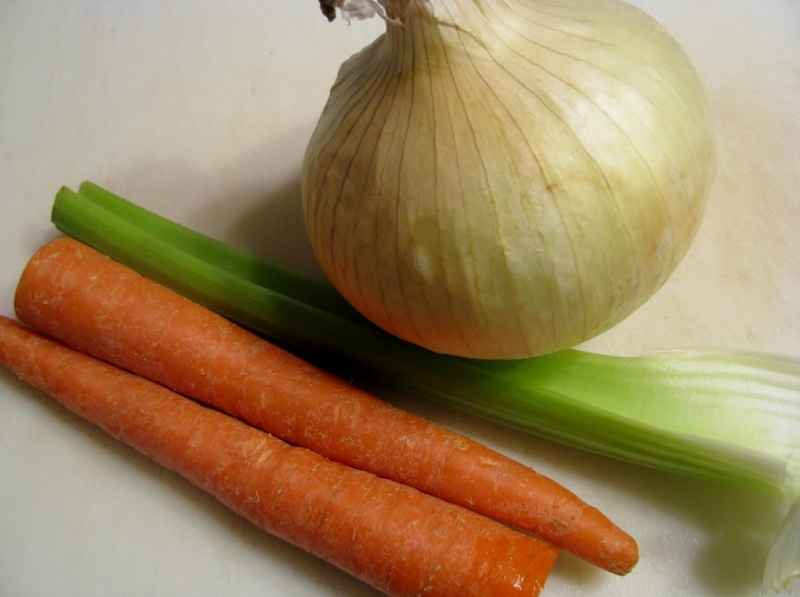 Add chopped carrots, celery, onions and mushrooms and simmer until vegetables are tender. Add remaining 1/2 Cup Burgundy, Worcestershire sauce, Parsley, Thyme and Basil, tasting as you add. I usually use 1 Tablespoon each of Worcestershire, fresh Basil and fresh Parsley, and 1/4 teaspoon of Thyme, but add these seasonings to suit your taste. When ready to serve, add some cooked egg noodles. DanLrene – Thanks for the link. 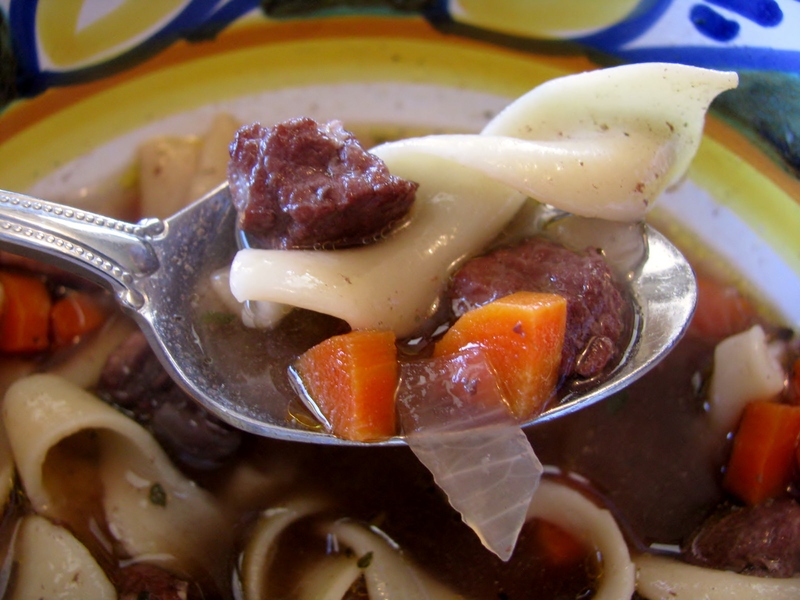 This soup is so much easier than Julia Child’s recipe and tasty, too. Maybe you could brown the meat and mushrooms and chop the veggies the night before so that when you got home the next day at 8 PM, all you would have to do is throw it together. I hope you like it! Thanks for visiting my site on Beef Burgundy. Worcestershire Sauce, interesting flavor. I never thought about this. Vidalia?….you rock. The Burgundy is wine-y and the Worcestershire is a nice contrast, I think. I follow baking recipes directly, but make lots of changes to cooking recipes. Thanks for your comment. Noodles are an interesting variation here. Must try that sometime. Love the pictures! Thank you. I keep trying, with the pictures…Sometimes it works and sometimes I have to try again, and again, and again! I made Great Northern Bean Soup for a friend yesterday and forgot to take pictures. Maybe I should take a picture of the blister I got from cutting all those carrots up into little 1/4 inch cubes! I hear you about having to take the pictures over and over again but that is what makes for good photography. Thank goodness for digital cameras! I’ve also got a great photo manipulation program and have discovered the joys of cropping! If you show me your blister picture, I’ll post the mess of a Tarte Tatin that I made! If you don’t mind sharing, which photo manipulation program do you like? Thanks for stopping by. It’s a deal. I’ll post a picture of my blister and my recipe for Bean soup shortly. I forgot to tell you which photo manipulation program I use. It’s the program bundled with Ubuntu Linux called Shotwell. Very simple and easy to use without a lot of fancy bells and whistles I wouldn’t use for food photography anyway but I’m not sure if they have a Windows version. My blister picture has been posted. Your turn. Thanks for the information. Tarte Tatin coming soon.